Racer watches are meant to capture the speed, grace, and performance of motor sports within their style and functionality. 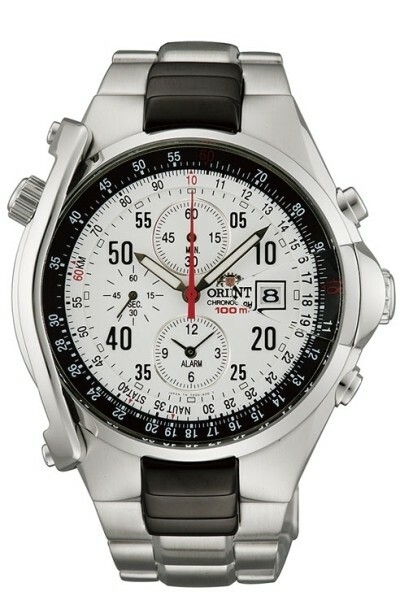 Orient captures the essence of racing watches by combining key elements of its precision mechanics and superior style. Let’s take a look at some of Orient’s amazing Racer watches. The Sparta certainly lives up to its name in design. This automatic watch has a tough yet sophisticated design that gives it a military feel. There are indexes within and outside the dial for the minutes giving it a mechanical and racing feel. This watch retails for $280. The Chute is a quartz racer that epitomizes the style. It has an alarm feature, a chronograph, date, and a slide rule all sleekly set on its dial. This watch is also perfect for everyday wear. It retails for $400. The Championship looks like a watch fit for the winner of the Indy 500. This watch has a smooth sapphire crystal and skeleton case back. With three simple sub-dials its dial is reminiscent of meters on a dashboard. This watch retails for $715.